Set in a meandering section of the Wye River valley about ten miles north of the border town of Chepstow, the skeletal ruins of Tintern Abbey evoke a peacefulness and solitude that is at odds with its turbulent past. Tintern was the model for the fictional Cymllyn Abbey in The Excalibur Parchment. My monks Thomas and Owain were at the abbey, as was the traitorous Gethin—a Druid leader infiltrating the Christian church. Tintern itself was abolished by Henry VIII in his dissolution of the monasteries. The lead roof was removed for its value, but the stone skeleton was left. Over the years the magnificent old church deteriorated but still retained a stark beauty. In 1798, the poet William Wordsworth wrote his famous poem “Lines composed a few miles above Tintern Abbey”. Interest in the old site picked up and it is now a well-restored ruin and a major tourist attraction. In the abbey ruins you see the outlines of the various supporting outbuildings—the Abbot’s residence, the infirmary, the monks cells and others. It stands on the banks of the Wye River in a fairly flat area surrounded by hills. It is rich agricultural land and, as you walk around the site, you can easily imagine the hustle and bustle of the monks and lay workers as they tended the crops and animals. You can also understand how this became one of the wealthiest Cistercian monasteries of its age—a wealth Henry was determined to seize. Standing inside the ruins of the magnificent church with its ornate stone decorations and window shells, you can also let your imagination run wild. I deliberately loaded some medieval chants onto my iPhone, plugged in my earpiece and let my imagination wander the monks deep melodious singing hymns accompanying me as I strolled down the nave. But in my mind, I was not at Tintern. I was at Cymllyn Abbey with Thomas and Owain as they served and then found themselves challenged with the discovery that the Abbots of Cymllyn had hidden and protected a tremendous icon for more than 700 years—the mighty Excalibur, King Arthur’s sword. From the ruins, I could see the river down which they escaped. And not too far away, the forested hills into which they fled and, beyond that, the open moorland they had to cross, pursued not only by vengeful Druids but by the soldiers of Lord de Tuberville. All in all, and evocative, peaceful and contemplative spot. 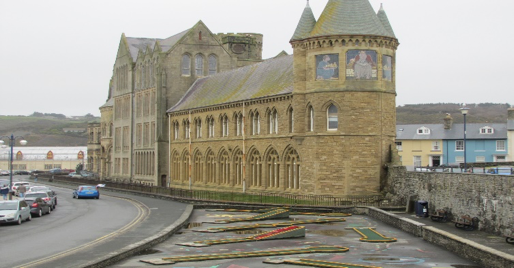 The Old College in Aberystwyth was the first university in Wales. Its first home was an old former hotel that had been built on the seafront and then extended, before passing into the hands of those who wanted Wales to have its own institute of higher learning. It became known as The Old College or, in Welsh Yr Hen Goleg. It is a key location in The Prince Madoc Secret. Interestingly, it was a forward-thinking university from its inception, offering women the same opportunities for higher education that were offered to men—a distinct change from the normal gender-based thinking of Victorian times. It was also developed partly thanks to the efforts of Non-Conformist ministers across Wales who collected “pennies of the people” to develop a starting fund of five thousand pounds—an enormous sum in those days. As time passed, the university outgrew the existing building. A new, sprawling modern university was constructed in the hills east of the town and today is a renowned school of higher learning. The charming seaside town is also home to the National Library of Wales. But the quirky old building on the seafront remains. At the invitation of some of the university’s leaders—who told me that ‘my professor’ (Huw Griffiths) had to do some of his research at the university. I agreed. And I went to the Old College to take a look when I was researching and writing The Prince Madoc Secret last year. I found a delightful, quirky building that really is an amalgam of architectural styles and construction. A magnificent triangular limestone leads into the substantial wooden doors at the entrance to the College. Inside, a massive grand stone staircase leads up to narrow halls. Circular metal staircases clash with wooden staircases. Halls go nowhere except to another set of stairs (stone, wood or metal) which lead to other halls and other staircases (stone, wooden or metal) leading down half a flight to yet more halls. Rooms, professors offices and lecture theatres feed off the main halls. Along the seafront side is a set of rooms occupied by Prince Charles when he was a student here learning Welsh and preparing for his investiture as Prince of Wales. The Old College is mostly devoid of students now. They’ve moved up to the main campus east of the town. Instead, there are plans to revive the Old College as a place for special events and concerts among other things. But it was just the right place for Stone Wallace and Mandy Griffiths to use as a base for their research into the legendary Prince Madoc. It’s a building steeped in history and yet timeless; a place imbued with a sense of learning and Welshness, set in a magnificent location beside the old castle which dates from 1277. History, culture, legend, idiosyncratic styles are all gathered at The Old College. It is worth a visit and worth a prominent place in the book. 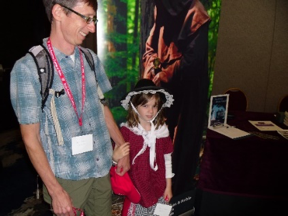 “The Prince Madoc Secret” was officially launched at an invitation-only event on May 5. 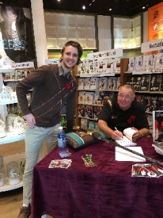 Guests enjoyed meeting with Barrie, getting some of the low down on how the book came about as well as learning a little about the legend of Prince Madoc. “For the full story, you’ll have to read the book,” Barrie told one guest. 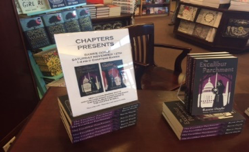 Almost 30 people came, enjoyed the event, looked at the displays and bought the book (and some even bought both of the previous novels as well. The next scheduled event is a book signing on May 19 at Georgian Bay Books in Midland, ON between 1 and 3 p,m. Enjoyed a great weekend in Kingston, Ontario at the annual Welsh festival. People from all over Eastern Ontario as well as parts of the eastern United States plus visitors (mainly a male voice choir) from Cardiff, Wales. 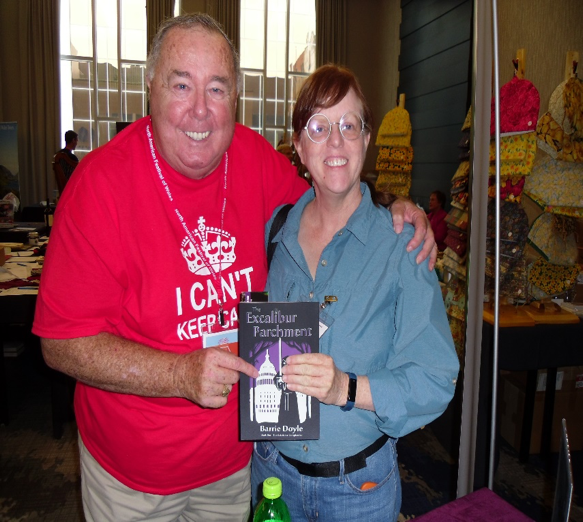 One lady bought the first two books at the North American Welsh festival in Calgary 2016. She was at the same festival in Rochester NY 2017 asking for the third book. She was in Kingston and finally got her wish! She bought The Prince Madoc Secret and went home happy. A number of the choir members and their families also purchased the newest book. More events later this year and we will be at the North American Festival of Wales in Washington DC late August. The Marketplace was well attended. We were able to bring out banner and Excalibur (can’t take it across the border L) which people enjoyed posing with. You’re supposed to stand within this sculpture where the “I” should be, but it was too cold and rainy. Don’t forget that The Prince Madoc Secret will be released in as few weeks. Check in on our website for information on various book events. If you have a bookstore near you that you think might like to host a book signing, please share this email with them and have them contact me direct. If you set up a confirmed book event, you’ll receive a free copy of the book. Here’s what one early reviewer said: I kept reading and telling myself, “okay, just half an hour more and then take a break”. No breaks. You’re a very good storyteller. I really got pulled in. I have found many authors have one or two good books in them, but they continue to write more. You, however have improved. While I thoroughly enjoyed the first two, Madoc is clearly the best”. If you have the opportunity to visit your local bookstore, here’s what two bookstores think about the books! Share it with your bookstore owner. And from The Reading Room in Penetanguishine, “At The Reading Room Bookstore in Penetanguishene, we look forward to the arrival of Barrie Doyle’s third book in his Oak Grove Conspiracies. 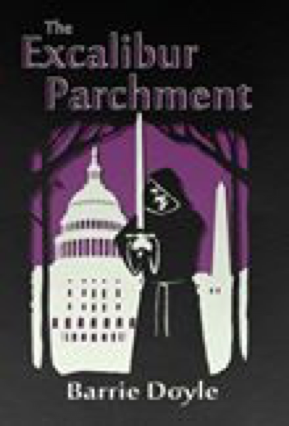 We held events for his first two books in the series, The Excalibur Parchment and The Lucifer Scroll. Both signings were well attended, and sales were terrific. 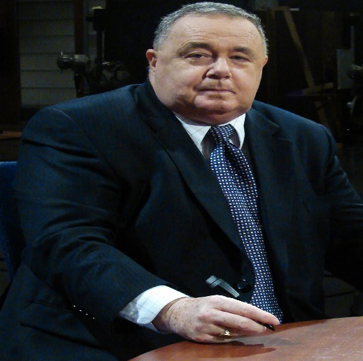 Barrie, after a long career in journalism, corporate communications, and public relations does a great job of promoting his books and events on social media and through his vast professional networks. He also shows up with props (the Excalibur replica is a huge hit) as well as terrific printed material. Those are just some of the comments we’ve been receiving. We have also found out that Waterstones (a major bookstore in the UK) now carries the books online. If any of you have friends or relatives in Wales or other parts of the UK who’d like to read these nail-biting thrillers, let them know about Waterstone’s. They can order online and pick it up at their closest store. I can always be reached by email (excaliburparchment@gmail.com) or you can follow me on Facebook or Twitter to get the latest info, photos, reviews and news. Looking forward to hearing from you and seeing you again at various events. Book 3, “The Prince Madoc Secret” to be released May 1! I am very pleased to announce that The Prince Madoc Secret is scheduled for release on May 1 and we are already planning a number of special book signings and events during the month of May. IF YOU WANT TO PRE-ORDER A SIGNED COPY, PLEASE USE THE EMAIL ADDRESS ABOVE. I was honoured to do a presentation for the St. David’s Day banquet in Sarasota FL on March 1. The host for the event was the Gulf Coast Welsh Society and the banquet was held at the stunning Laurel Oaks Golf and Country Club. After some fine music and singing, I spoke about Prince Madoc and the possibility that he sailed to North America some 300 years before Columbus. I tried to present evidence both for and against this legend, but was delighted to tie the legends into my newest book The Prince Madoc Secret which explores that legend and the possibility of its veracity. The warm weather didn’t hurt either! Here are some photos from that wonderful evening. It’s been a busy Fall, finalizing the writing (and rewriting), editing, proofreading, dealing with the publisher, graphics and assorted other matters for The Prince Madoc Secret, while still marketing the first two books in the series. The big news is that I have finalized the front cover of The Prince Madoc Secret. It (and the previous two book covers) was designed by Ross Lawhead, a novelist in his own right as well as graphic designer. I like the ominous nature of the storm about to descend on the tiny ships; and implicit is the clouds is the dark threat of the Druids. Take a look at the covers of the other two books later in this newsletter and see the ‘family look’. This story explores the legend that the Welsh Prince Madoc spurned his heritage (and the resulting wars of succession) under King Owain Gwynedd. Instead, he sailed the Atlantic Ocean to North America some three hundred years before Columbus, landing eventually in Mobile Bay. Alabama. He never returned to Wales, but disappeared on the vast continent. The legend grew. Forts and buildings, allegedly built to a Welsh or European design, were found on native lands. Stories abounded that a tribe of Indians was ‘Welsh-speaking’. US President Thomas Jefferson reportedly assigned Merriweather Lewis to privately investigate this while he conducted his famous Lewis and Clarke Expedition. The story convinced a lot of people, including a Chapter of the Daughters of the American Revolution (DAR) who placed a plaque commemorating Madoc’s arrival. 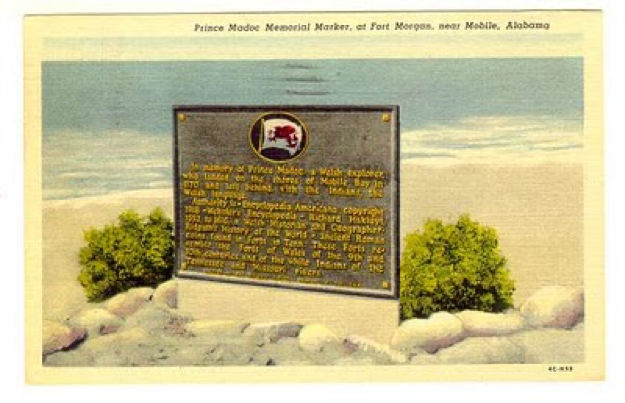 For years it was at Fort Morgan on one of the barrier islands protecting Mobile Bay. As we explore the legend in this story, our protagonists Stone Wallace and Mandy (Myfanwy) Griffiths are caught up again in Druid machinations and terrorism both in Britain and in the United States. This time, there’s a discovery that Madoc was transporting a secret to the Americas on behalf of the mysterious Knights Templar. Stone and Mandy are intrigued; the Druids are convinced it is an icon that, once in their hands, will destroy the church and therefore the roots of western democracy. A new Dragon Master, beset by opponents internally, has only tentative control. He needs a victory. At the same time, the Druid movement in America is in turmoil, bedeviled by murder and infighting but planning a massive terrorist incident that will set the country ablaze. When in Wales writing and researching Prince Madoc this year, I was invited on a private tour of the University’s historic Old College on the seafront. After all, my Welsh professor Huw Griffiths and his daughter Mandy, would have to utilize the University’s resources as well as the National Library of Wales, also in the seaside town. We had a wonderful visit. Thanks to the Alumni Director Louise Perkins. What a quirky, unusual and totally fascinating place! We’re already planning the launch for the third book. More details soon, but expect it to be in the Spring 2018.On December 7, Barrie will be speaking at a writer’s conference, discussing his stories and career and also participating in a Q&A with budding writers. It will be held at the Barrie Public Library in Downtown Barrie. In January we will be listing our 2018 schedule but already are anticipating appearances in Kingston ON, Washington DC and possibly an event in Florida. Stay tuned. Check out our video channels on both Youtube and Vimeo for background on the stories, how I wrote the books, how much research into places and history was done to support the books as well as other nuggets of information. We are currently revising our website www.barriedoyle.com and it will have a new look and feel. We will relaunch the new site soon. But in the meantime, the current site is still active. Check it out for more details about the books, my schedule, reviews and ordering information. Latest figures show more than 700 copies of both The Excalibur Parchmentand The Lucifer Scroll have been sold so far. What a wonderful realization that so many people are not only buying, but really enjoying the books. It has been fun writing them and even more fun meeting and interacting with readers at various book events. Invariably, the question arises, how (why) did you write the books? They emanate from my love of history and the profound impact history has on today’s society—both for good and evil. It has been said that if we don’t learn from history, we are condemned to repeat it. Greed and power seeking has long been part of the human psyche, as has the desire to revere icons as tools of power. We see that in the famed Spear of Destiny (featured in The Lucifer Scroll) as the icon Charlemagne, Napoleon and Hitler all sought, believing it contained supernatural powers that would lead them to world conquest. Similarly, icons such as Excalibur (The Excalibur Parchment) are portrayed as powerful national symbols to be revered. Today, the same use of iconic objects and the same greed for power drives zealotry around the world. And we, as a society, see the results in terrorist atrocities in London, Berlin, Nice, Manchester and other places. I hope that my books, in an entertaining way, can peel back some of the mystique around terrorism and show that there is good that will overcome evil; that there is hope in a fragile world. Who is Prince Madoc? What’s his secret? The third book in the series is “The Prionce Madoc Secret”, which begs the question who in the world is Prince Madoc. This is the stuff of which legends are made and in which history and mythology, born out of an oral historical tradition, lead us to some fantastic stories. Madoc was the son of Owain, King of Gwynedd (in North Wales). Although he was an heir to the throne—along with four other brothers—he wanted no truck or trade with the internecine warfare that would follow Owain’s death. He loved the sea. Reportedly he sailed west with a group of companions and followers, eventually landing in Mobile Bay on the border of what is now Florida and Alabama. The Daughters of the American Revolution (DAR) placed a plaque on his supposed landing site, so convinced were they of the story. 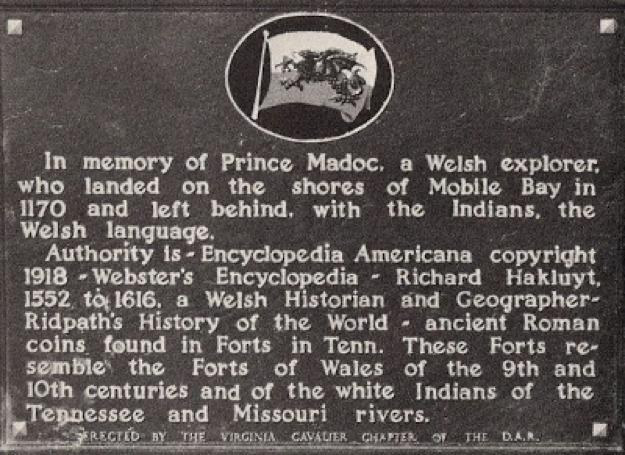 Madoc never returned to Wales and legend says he and his people sailed up the Mississippi, everntually intermarrying with the native peoples and building stone fortresses along the way (which now baffle historians and archaeologists) leading to stories of a Welsh-speaking tribe. President Thomas Jefferson wanted to seek the truth and that was one of the mandates he gave the famed Lewis and Clark expedition; find the Welsh-speaking tribe. 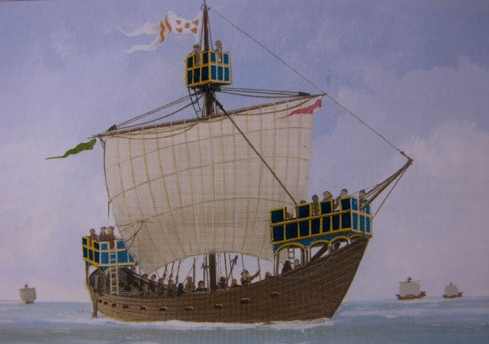 The question I pose in this novel is, “did Madoc sail west because he was fleeing his home or because he was on a mission, carrying a secret away to safety?” In that premise, what was the ‘secret’ and how does it impact the modern world. In particular, how will it impact Stone Wallace, and Huw and Mandy Griffiths? This year I’ve had the opportunity to attend a number of special festivals, including the North American Festival of Wales (NAFOW) in Rochester NY and the Niagara Celtic Festival. The books have been warmly received and many wonderful comments and reviews resulted. I appreciated all of them so much. 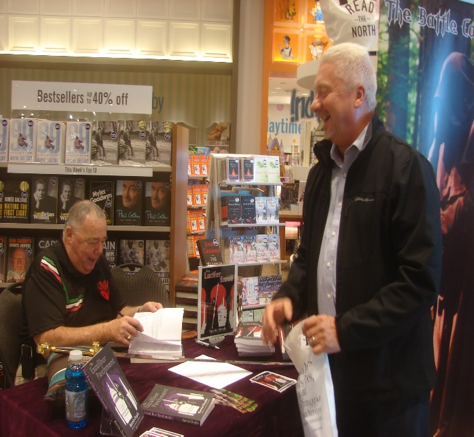 Apart from those festivals, we were also at the Ontario Welsh Festival in Stratford, did book signings at various Chapters and Indigo stores across Ontario as well as in Wales and in Orlando, FL, and had the privilege of speaking at a number of churches. In September, I did a presentation on “History, legends and the art of storytelling” in upstate New York at the Celtic Festival. The rest of the fall is dedicated to finishing and editing The Prince Madoc Secret with a presentation in October at the Barrie Public Library (no, it’s not named after me. It is a city in Ontario) and in December at an independent author’s event. For a full list of events, contact me. 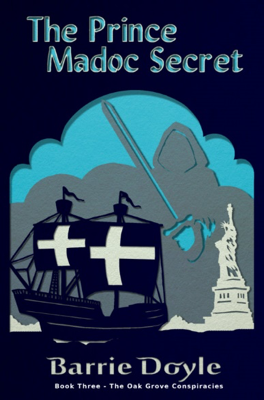 In 2018, we’ll do the launch for The Prince Madoc Secret and are also already scheduled for the Ontario Welsh Society in Kingston (April) and the NAFOW in Washington DC (Labour Day weekend). More to come. Just a reminder that if you have a group or association interested in books, mysteries, history or the like and want to book a presentation, please contact me for availability. I will work with you to tailor a presentation especially for your group and its interests. And, it goes without saying, if your local Welsh society wants to learn more about Madoc, Excalibur and how they tie into modern Wales and society, please let me know. Bruce Rogers, one of Canada’s premier broadcast journalists, recently read and reviewed The Lucifer Scroll. He said: Your ‘Lucifer Scroll’ is one hell of an adventure! 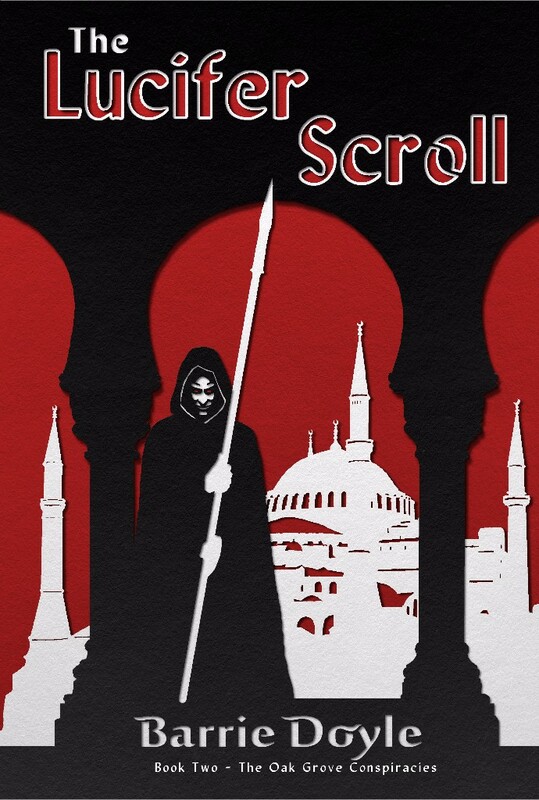 Fast paced and intriguing, you had my attention with the opening that recalls the Islamic siege and the eventual fall of Constantinople. Then you took me on a breathtaking trip touching Georgian Bay, Arizona, D.C., Ireland and Wales. I could almost hear the street noise in Istanbul. Thanks for the fun. Well done! Hollywood producer, author and scriptwriter Coleman Luck said this: The Lucifer Scroll takes us on another strange, wild ride that spans centuries and continents. We race from Turkey, to Canada, then to the American Southwest and Wales, facing danger and evil in search of ancient writings; penned in ultimate darkness. Barrie Doyle has done it again. Yes, I do think you should read this! 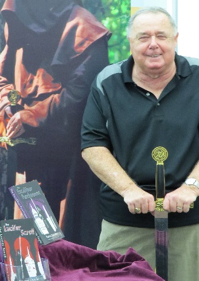 Sword-wielding author Barrie Doyle, accompanied by piper Trevor Lethbridge, welcomes visitors to a reading at the Penetanguishene Public Library on Jan. 27. The event was held to celebrate Literacy Week. The Tiny Township resident is the author of the novels “The Excalibur Parchment” and “The Lucifer Scroll,” which have references to the Georgian Bay area.